Heavy rain extended northward into Canada, where Sherbrooke, Quebec reported 107 mm, and Doaktown, New Brunswick had 89 mm. Montreal measured 56.4 mm, bringing the monthly total to 223.0 mm; normal for August is 92.7 mm. August 28, 9 PM Update: Today's 3.99" of rain at Central Park, New York breaks the old record for the date of 1.80" set in 1971 and raises the new all-time monthly record to 18.95". That is 464% of the normal August amount to date. The Irene storm total is 6.71". HIGH TIDE IN COMBINATION WITH THE ASTRONOMICAL TIDE. DURING THE NOREASTER OF DECEMBER 1992. August 28, Noon Update: The storm total rainfall of 6.71" at Central Park brings the monthly total to an unofficial 18.79", which is an all-time monthly record for New York City. The previous record was 16.85" in September, 1882. Midnight Update: Philadelphia had 1.70" of rain in the 6 hours ending 8 pm and an additional 2.14" in the following 3 hours. 9 PM Update: Suffolk Airport in Virginia is reporting a storm total rainfall so far of 11.04". The Norfolk official total is incomplete, apparently because of a sensor failure of the automated station, but a co-operative observer reports 7.73". OF 14.00 INCHES REPORTED AT BUNYAN NORTH CAROLINA THUS FAR. Philadelphia has also added to its all-time record monthly rainfall with a total so far of 14.38". With 0.39" so far today, Central Park, New York has reached 12.47" for the month, which sets a new record for highest August rainfall. August 27 Update: Added chart of 30-day precipitation. AIRPORT YESTERDAY, THE AUGUST MONTHLY TOTAL NOW STANDS AT 13.61 INCHES. SEPTEMBER 1999 /MOSTLY HURRICANE FLOYD/. WILL PUSH THESE RECORDS HIGHER. Great Hurricane of 1944: Irene's Billion-Dollar Grandma? 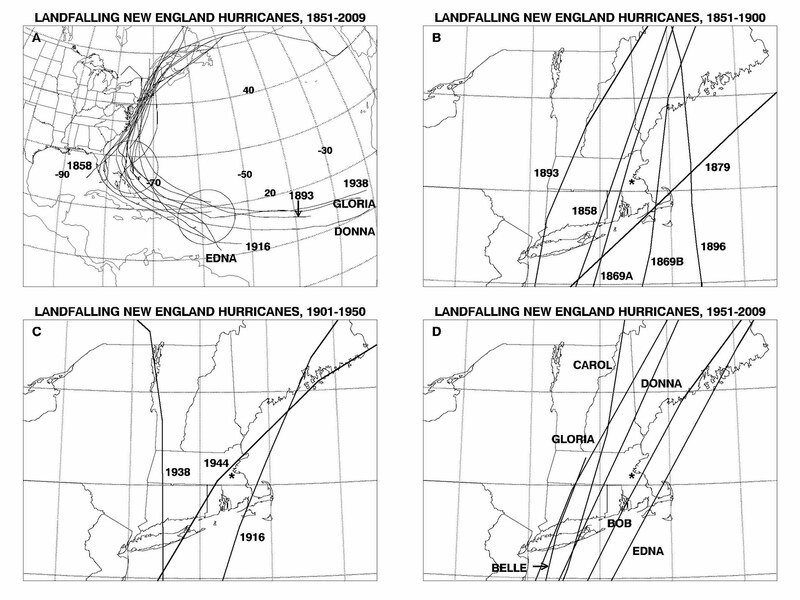 An analysis published by Blue Hill Observatory shows that 247 tropical cyclones have affected New England in some form since official records began in 1851. Of those, 90 have been hurricanes, but only 15 have made direct landfall on New England or Long Island, an average of less than 1 every 10 years. Only 6 have made landfall after 1944. The most recent was Bob on 8/19/1991. The others were Carol (1954), Edna (1954), Donna (1960), Belle (1976), and Gloria (1985). 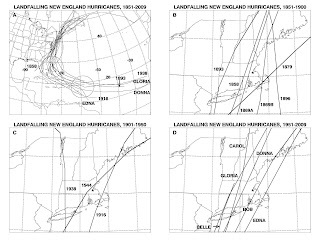 The 1944 storm, first detected as a fully developed hurricane northeast of the Windward Islands on September 9, skirted the coast near Cape Hatteras before making landfall over eastern Long Island, passing over southeastern New England, and moving along the coast of Maine as an extratropical storm. At its maximum intensity, it was a Category 4 storm east of the Bahamas, diminishing to Category 1 at landfall. the plane could not be kept under control, and several times it was feared it would be torn apart or crash out of control. When they returned to base it was found that 150 rivets had been sheared off on one wing alone. Although the Great Hurricane remained offshore before reaching Long Island, it brought very strong winds and heavy rainfall to the Mid Atlantic coast. Highest winds at Cape Hatteras were 110 mph, and the barometer reached 947 mb (27.97 inches of mercury). As the storm moved east of Norfolk on September 14, the highest wind speed downtown was 73 mph, gusting to 90 mph. The 3.97" of rainfall set a record for the date which still stands. The lowest barometric pressure at Norfolk was 985.7 mb (29.11 inches of mercury). The sustained wind speed of 134 mph at Cape Henry in Virginia Beach was an all-time Virginia state record. Inland, precipitation amounts were much lighter. Both Washington, DC (2.51") and Baltimore (3.15") set still-standing daily records from a stalled frontal system on the 13th, when the storm was still off the coast of Georgia, but received only token amounts from the hurricane itself (0.19" at Washington, Baltimore not available). During the storm, New York City saw sustained hurricane force winds of 130 km/h (81 mph) with gusts up to 158 km/h (99 mph). Damages consisted of power outages, some lasting 10 days, and downed trees throughout the city. In nearby Long Island, damages totaled $1 million (1944 USD) on the eastern half of the island alone. The beach eroded up to 6 m (20 ft) in some places, causing houses to be taken by the sea. In Connecticut, the most significant storm impact was the heavy, widespread rainfall. Totals of around 178 mm (7 in) were seen in the Hartford area, but the city of Bridgeport saw the greatest official total at 272.8 mm (10.7 in). Tobacco and fruit damage in Connecticut totaled to about $2 million (1944 USD) with similar overall damage costs occurring in Rhode Island. Greater than $5 million (1944 USD) in damage done on Cape Cod can be attributed to lost boats, as well as fallen trees and utility damage. Wind records to date were set at Atlantic City (91 mph from northeast), New York (99 mph), and Block Island (88 mph from southeast). The 3.94" of rain on the 13th and the 3.82" from the hurricane on the 14th combined to help make the month the 4th wettest September at Central Park, New York. ship or shore station. By noon on the 13th, it was apparent that WARRINGTON'S crewmen could not win the struggle to save their ship, and the order went out to prepare to abandon ship. By 1250, her crew had left WARRINGTON and she went down almost immediately, stern first. Out of the ship's complement of 20 officers and 301 men, only 5 officers and 68 men were rescued. Two Coast Guard cutters, a minesweeper, and the Lightship Vineyard Sound were also sunk by the storm. At 2 pm CDT today, the Austin temperature reached 100°, marking the 69th day this year with 100° or higher temperatures. This ties the record set in 1925. The current temperature is 101°. 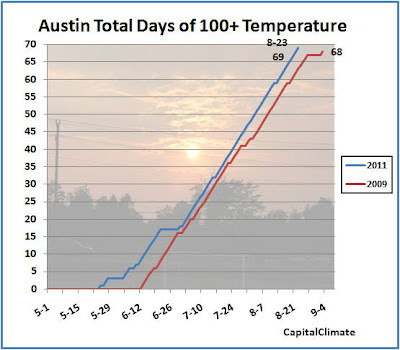 Del Rio and San Antonio have not yet reached the century mark today. Through yesterday, they have had 72 and 43 100° days, respectively. The Del Rio total is tied for second highest, and the San Antonio total is the second highest. 6 PM CDT Update: Today's high at Houston was 101°. And don't forget Austin, where tomorrow is Tie Day. 4 PM CDT Update: The temperature at Houston Intercontinental is 100° at 4 pm, breaking the record with 33 days so far this year and extending the consecutive day and monthly records to 22. With a temperature of 99° at 3 pm, local time, downtown Houston (Intercontinental Airport) is 1° away from breaking its record for the number of days in a year with temperatures of 100° or higher. The high temperature of 103° yesterday tied the record of 32 days originally set in 1980. It was the 21st consecutive day with 100° temperatures. The previous record was 14 days ending July 19, 1980. The previous record for total number of days in a calendar month was 18, also in July, 1980. Houston Hobby, with 12 days so far this year, is one behind its record in 1998 and 2000. Downtown Houston climate records began in 1892, and Hobby records began in 1930. 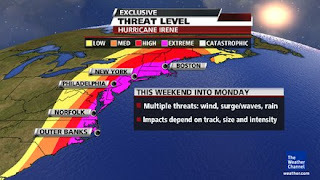 Aug. 27, 5 PM Update: The New York August rainfall record has already been broken with the approach of Hurricane Irene. Aug. 25, 2 PM Update: An additional 0.47" so far today brings the monthly rainfall total to 12.06", within 1/3 of an inch of the August record. Aug. 22, 10 AM Update: The preliminary monthly total rainfall of 11.59" at Central Park is confirmed. Sunday's daily amount of 2.06" at Kennedy Airport is also a new record for Aug. 21, breaking the old record of 1.61" set in 1997. This brings the monthly total there to 11.94". That is well above the previous August record of 8.30" in 1976, although continuous JFK records date back only to 1964.